Temperature is crucial to maintaining the grain quality in a grain storage system. 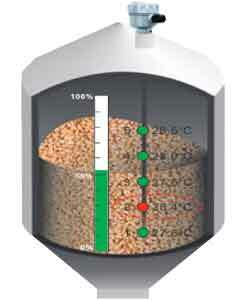 Whenever grain rots or when there is a pest problem, the temperature in the Silos will rise to indicate there is a problem.In traditional storage silo management, users must install a temperature sensing unit and a separate level transmitter separately to retrieve both the temperature data and level information. The system is a combination device which is capable of measuring both temperature & level of the material simultaneously to enhance real time monitoring o the grain. Build with RS-485 communication interface, the device is able to transmit data to a control center or HMI which allows users to remotely monitor temperature and level changes inside the silos. • Integrated temperature & level monitoring. Unique innovation in global industry. • Strengthened steel cable design to sustain impact from media to prolong product life. • Multi-points temperature sensing to enhance prompt management of grain temperature control. • Real time monitoring of silo temperature for food, animal feed, grain and etc., to extend media preserve. • Prevent grain rotten or fire caused by high temperature. • Any two point calibration for level measurement. 2. Carbon Dioxide Sniffer to detect minutest of biological activity in the silo due to insects, fungi, bacteria and other microbes. 4. Weather Station for automatic operation of Aeration Fans in respect to the ambient temperature and humidity 5. Ozonators : To completely (100%) sterilize the crops/ food grains of any insect or microbe without any harmful effects to humans or crops and removes the requirement of any fumigation process.